SPRINT™ technology | Aviation Products | Renishaw Inc.
Next-generation high-speed, high-accuracy probing systems for fast part set-up and machining process control. 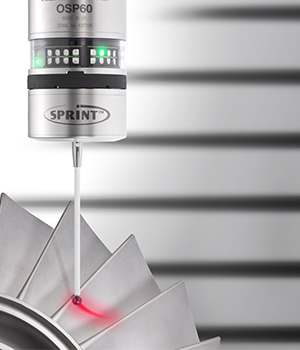 Probing systems with SPRINT™ technology, use the unique 3D sensor technology within the OSP60 probe to provide exceptional, high-speed, high-accuracy, probing to CNC machine tools. SPRINT™ technology can be used with either SupaScan or the Productivity+™ Scanning Suite.